Robo Advisors – Any Good Ones Yet? Today’s post is an update on the state of play in the robo-advisors area. This post is part of a series of articles on Robo Advisors and Ready-Made Portfolios. You can find links to all of the articles – plus a live spreadsheet summarising our findings – here. 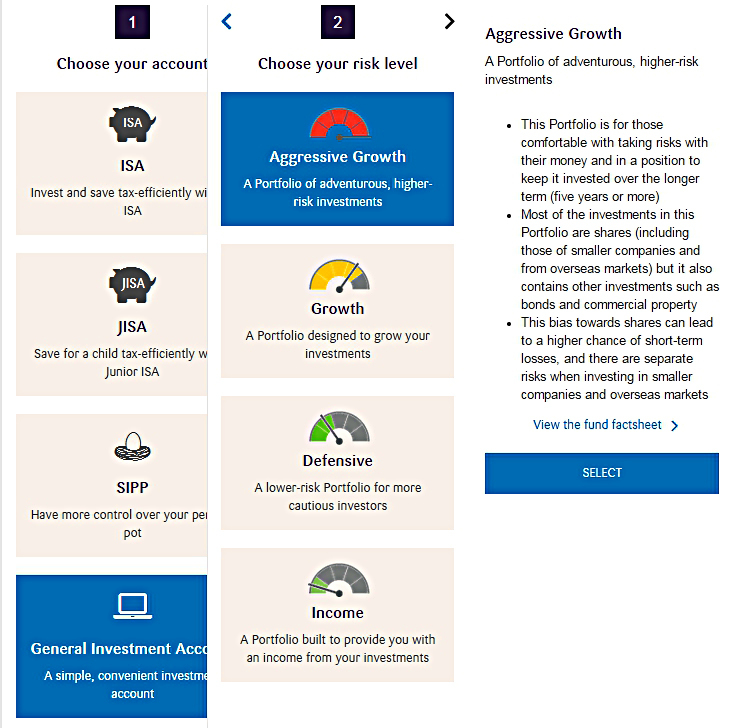 Back in June we compared three ready-made portfolios from the early providers in the robo-advisor space: Nutmeg, Hargreaves Lansdown and Fidelity. Then we’ll compare all six to see if we can recommend any of them. We’ll also compare the robo-advisors to the DIY options from HL and Fidelity that came out well in our review of drawdown options earlier this month. In addition, I’ll compare the options to our own diversified ETF portfolio. Let’s see if anything has changed. 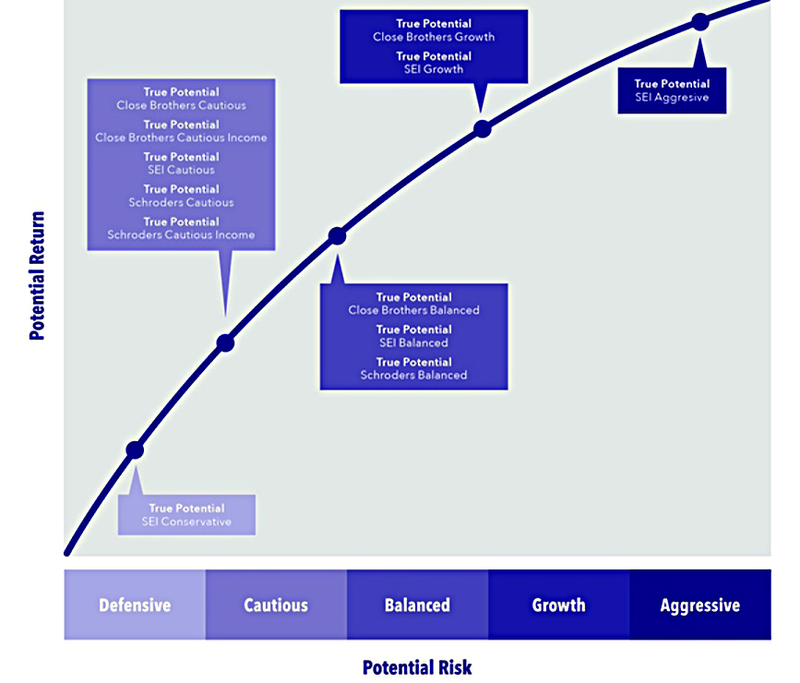 True Potential offers five risk profiles to choose from, each of which is made up of between two and eight “multi-asset” funds. The funds come from Schroders, Close Brothers and SEI. A creepier feature is that they are involved with the Open University financial education initiative – “The True Potential Centre for the Public Understanding of Finance”. 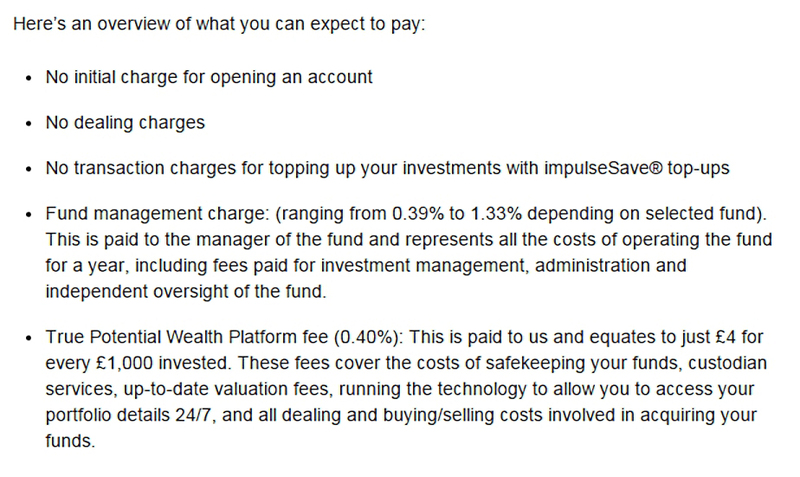 Fees on the funds range from 0.3% to 1.33%, and True Potential charge a platform fee of 0.4% on top. So a typical annual fee might be 1.2%. Way too much for access to a limited range of bog-standard funds. 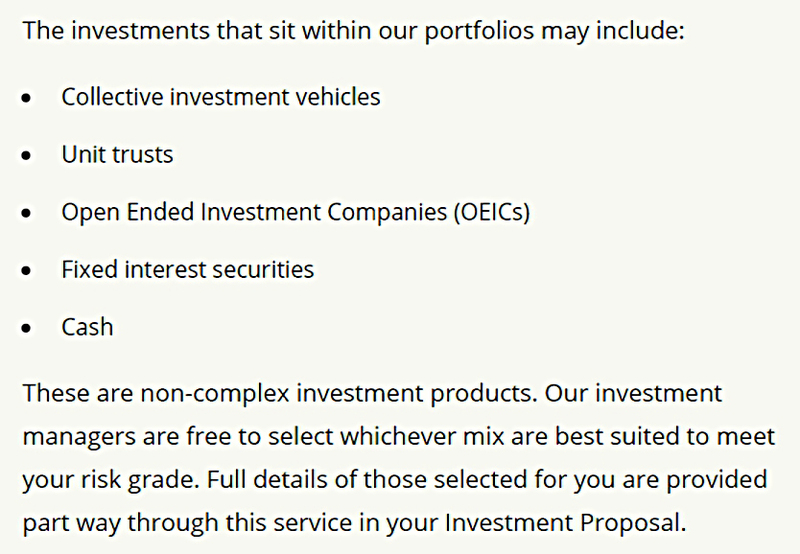 Wealth Horizon (WH) are quite cagey about their portfolios, only revealing to casual visitors to their website that they use OIECs / Unit Trusts. Wealth Horizon’s gimmick is that they back up the online service with an advisor at the end of the phone if you have a problem. WH are unusual in charging a 0.25% starting fee. After that, the underlying funds charge 0.18% – low for unit trusts, so presumably they are all index trackers – and there is a platform fee of 0.75%. So a typical annual fee is 0.93%. Still too high and don’t forget the upfront charge of 0.25%. 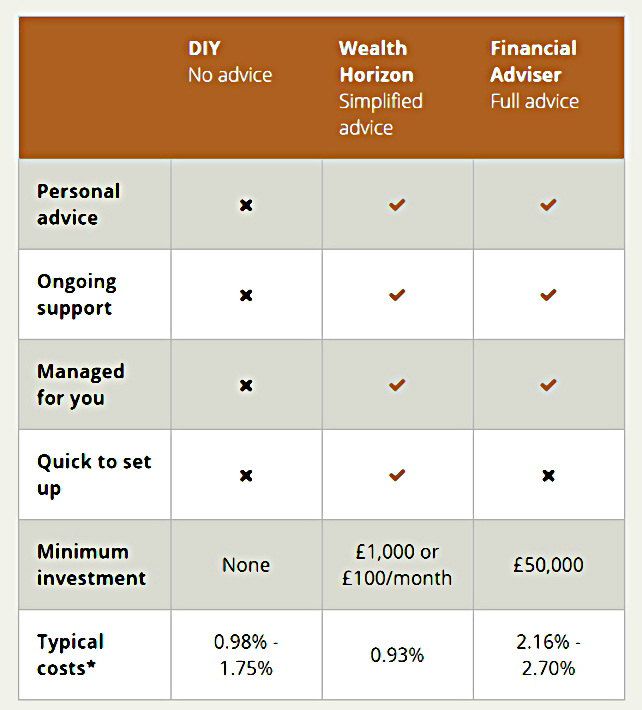 WH also has a misleading table comparing their costs with those of a DIY investor and an advised investor going through an IFA. They’ve dug up some survey on “typical costs” that shows them in a good light. 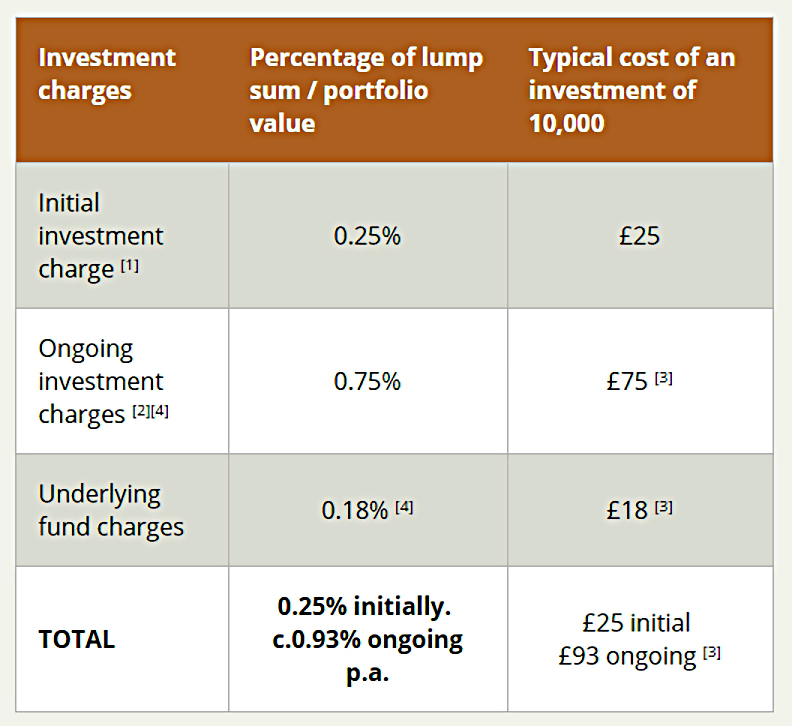 I’m prepared to accept that IFAs punt investors into funds charging more than 2% a year, but according to them, typical DIY investors pay between 0.98% and 1.75%. As I will demonstrate below, a private investor can replicate what WH is offering for half the cost. They lose points for this table. Bestinvest has a simple proposition – four pre-existing multi-asset funds at varying risk levels, in a free wrapper. The problem is that the funds are expensive. The cheapest fund is the defensive fund, which has a good asset mix but charges 1.47% pa. The most expensive fund is the aggressive fund. That also has a decent asset mix, but charges 1.59% pa. So a typical fee is 1.53%, the highest of the three we’ve looked at today. I’ve included two versions of the ETF portfolio because YouInvest is cheapest in accumulation, but as we found out last week, HL are cheaper in drawdown. Let’s get rid of the also-rans first. Of the six robo advisors, Nutmeg is the cheapest – though not by much, and Bestinvest offers superior diversification. Wealth Horizon and Headstart are cheaper than Portfolio+ and True Potential. But none of the robots can compete with the DIY options. Fidelity’s index funds are the cheapest, and YouInvest’s ETFs are competitive on cost as well as offering the best diversification. As the portfolio size gets larger, the options with dealing fees and fixed annual platform fees (basically, the ETF options) become more attractive. There are also cuts in the ongoing fees from Fidelity (index funds) and Nutmeg at the £250K level. Not much changes in terms of decision-making, however. Fidelity index funds are the cheapest way to go, and YouInvest ETFs offer the best diversification at the second-lowest cost. Nutmeg is now clearly the cheapest robot. The £500K portfolio level triggers another cut in the ongoing fees of Nutmeg, increasing its lead as the cheapest robo advisor. But Nutmeg remains £20K more expensive over 20 years than the Fidelity index funds, and £11.5K more expensive than a hand-picked portfolio of ETFs placed with YouInvest. So stick with the DIY approach. Use Fidelity index funds for a basic passive strategy, or use ETFs at YouInvest for more control and less volatility. See also: Lang Cat Platform Review 2017 - Are You Being Served? Wealthify launched after I wrote the post. Does it have any advantages over, say, Nutmeg? – Looks like passive funds (OEICs) rather than ETFs, but fees are 0.5% to 0.7%, plus an average of 0.28% for the underlying funds – so 0.8% to 1.0% in total. – The asset mix looks a bit better than Nutmeg, but there isn’t too much information on the website. Still looks like significantly higher costs than DIY for not much. Are you a Wealthify customer? Not yet. Contemplating it over nutmeg given an ‘easier’ option than DIY. Well if you do decide to go ahead, please report back on your experiences. I’m very interested in robo-advisors – I just think that they aren’t cheap or flexible enough at the moment. 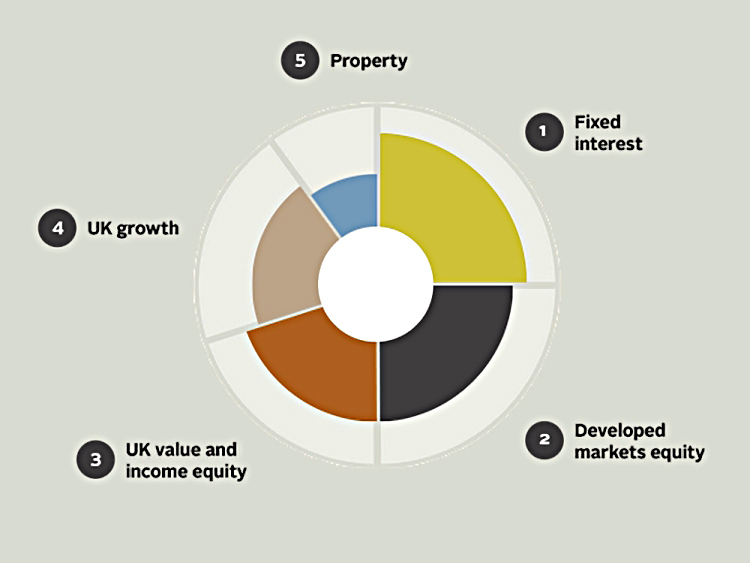 7 Circles > Passive & Assets > RoboAdvice > Robo Advisors – Any Good Ones Yet? The investor’s worst enemy is likely to be himself.